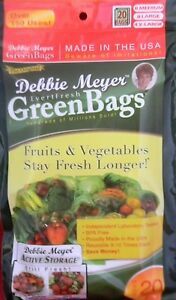 Debbie Meyer Green Reusable Fruit & Vegetable Storage Bags 10 Large & 10 Medium. 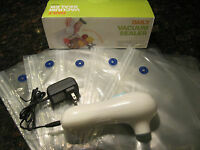 Handy Daily Vacuum Food Sealer with Five Zipper Bags 10" x 11"
This is my second 20 Bag Debbie Meyers Green Bags purchase. The first set lasted far longer than the suggested 8-10 reusable times. It consists of 8 medium bags, 8 large bags and 4 extra large bags. The bags really preserve the freshness of all my produce better than glass containers or plastic bags. Because I make a lot of smoothies, I like to keep a lot of fresh fruits and vegetables on hand so these bags are an essential. Can't Live Without These Bags! I have used these for many years and can't go without them. These bags elongate the life of produce and have 3 sizes. Toss after 8 uses each and don't wash produce before storing in theses bags. These bags are the originals and NOT knockoffs like some I have purchased from another seller. Buy only DEBBIE MEYERs green bags, not anyone else's which are cheaper. DM green bags are extremely sturdy, expandable on the sides unlike other IMITATION green bags which are flat, flimsy, tears easily. I bring my DM bags to the grocery, put my vegetables from grocery to refrigerator. I reuse them as well. Love the medium and medium and large, xl is a bit too big for me unless you are putting 10-15 apples. My fruits and vegetables lasts many times longer, great for gifts as well.